Here’s a terrific recipe for a delicious low sodium barbecue sauce that you will want to use again and again. It features all the flavor, and more, of commercial barbecue sauces without all the unnecessary sodium. 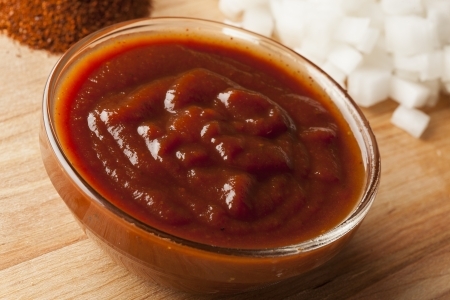 Barbecue sauce varieties and flavors vary greatly from region to region. Most commonly, traditional barbecue sauce is a combination of a tomato base (such as ketchup), vinegar, brown sugar and spices (onion, garlic, mustard, pepper, etc.). If you’re following a low-sodium diet you’ll find that most commercially available barbecue sauces are full of large amounts of sodium. A 2-tablespoon serving of many commercial brands can have upwards of 250mg of sodium. That’s simply too much! For this low sodium barbecue sauce recipe, we’re going to use the basic ingredients, without the added salt, to make one of the most delicious barbecue sauces you’ll ever have. With just a few simple ingredients, you can make a sauce that can be jarred and saved for later use as well. And imagine how your favorite dish will taste with your own barbecue sauce added. If you’re looking to spice things up a bit, you can always add some cayenne pepper powder. If you’re looking for more flavor from the onion or garlic – simply add more. This recipe will give you a base to start with which will be delicious. Feel free to experiment a little if you like. And most of all, enjoy barbecue sauce without all the unnecessary sodium! This low-sodium barbecue sauce can be stored in airtight jars in the refrigerator for up to 1 month. You can also freeze in airtight freezer containers for up to 6 months. Using a large saucepan, whisk together all the ingredients and bring to boil over medium heat. Reduce heat and let simmer, covered, for 30 minutes. This was exactly what I wanted it to be. Great for pulled pork! That’s one of the very dishes i’ve used it for. Hope you enjoy! Hi Christie, i’m currently in the process if obtaining nutrition labels for all the recipes here. In this particular recipe, only the no-salt added ketchup and the no-salt added tomato paste contain sodium, and very small amounts at that. Please check back soon for exact numbers. In the meantime, it’s approximately 16mg of sodium per 2 tablespoon serving.